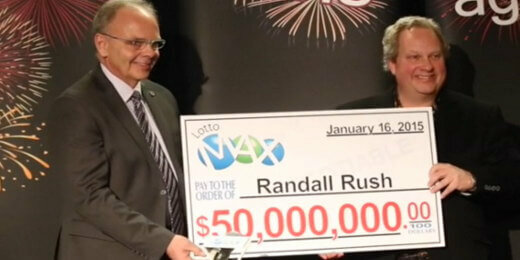 Randall Rush’s extraordinary lottery story started in a very ordinary manner. He had even less than the average person because he was so poor at one point when he was in his twenties, that he almost became homeless. He never married and never had much family or even relatives to speak of. That he got through the hard times, he attributes in part to the help of people who have been kind to him. Until his big win, he was working at Hertz Equipment Rental. Other than that he was just an ordinary working man, and until about six years ago, he never even touched a lottery ticket. But that changed when he saw numbers flash before his eyes as he was watching a football game at his friend Darrell’s house. At that time, he took that as a sign that he would win the lottery someday. It was at the urging of a friend that he actually began buying lottery tickets every week, without fail, using the numbers he saw in his vision. Like everyone else, he dreamed of what it would be like if he actually won; things like how he would spend the money and all that. But he says that in the last two years leading up to his win, he did not just believe he would win, he was sure of it. Of course, even if he said he was sure he would win, Rush had no idea exactly when that would happen. The ticket that finally gave him his long awaited win came via a purchase at Lamont Grocery in Lamont. The ticket contained the same set of numbers he started playing just six years ago, the only difference was that this time, finally, all seven numbers in his Canada Lotto Max ticket matched those drawn. And the prize had rolled over to a huge $50 million by then. When he went to check that day, the last ticket he scanned was the winner. Then all hell broke loose as he started screaming and now thinks he may even have been hyperventilating. The girl at the till contributed to the pandemonium as she was also busy screaming with joy. Randall Rush had trouble processing the fact that he was now suddenly a millionaire many times over. What Makes Randall Rush Extraordinary? When Rush was interviewed about his win, one of the first things he said was “To whom much is given, much is required.” Through all the excitement of suddenly having more money than he ever had at his disposal, one of the first thoughts that came to his mind was that having so much blessings gave him a responsibility to be a blessing to those in need; in fact he has stated that is what he wants to dedicate the rest of his life to. That is not to say that Rush is not going to enjoy any of the money. He has already resigned from his job and plans to buy two fancy cars; most probably a Porsche and a 1965 Chevy Corvette. What is truly amazing is that, this early, he has decided that the bulk of his winnings will go to charitable causes. He has said that he will not forget those people who have been kind to him over the years, and is determined to help them. He plans to use most of his winnings to set up a trust fund whose interest will go towards charitable causes worldwide. He has never forgotten how he almost became homeless and that drives him to want to help other people. He wistfully says a foundation will enable the fund to keep on giving long after he has gone back to his Creator. The world will be a much better place if we had more people like Randall Rush. When so many people are getting criticized for being overly materialistic, here is a man who will take only what he needs and contribute the rest to the less fortunate. And to me that makes Randall Rush a true winner, in this life and most importantly, most probably in the next as well. If you’d like to raise a glass and congratulate Randall, add your comment below. I’m sure he’d be tickled to see it. I am so happy for you! And the fact that you are going to help people in need. My Husband and I have always dreamed of winning and being able to help people in need If the LORD would just see fit. We too are like you said you were at one time, we are really down on our luck and may soon be without a home due to my fault of letting my self be scammed really bad 🙁 It is just so refreshing to see that their are still some good people left in this old world that are still caring! Unlike the scum that took my hard earned money and left me in total devastation 🙁 May GOD continue to BLESS You. Sorry Jan, but this is not the place for funding requests of any kind. Congratulations on your fantastic win. I am 74yrs old and have huge money problems. I have been entering the FreeLotto for a few years now but nothing has come my way. If I won the Lottery I would give some to the Homeless and the Children’s Trust where I live in Andover, Hants. United Kingdom. If you see fit that I may have a something from your vast win that would be wonderful. Real luck, I wish I had mine; enjoy it. GOD BLESS YOU. Happiness is winning the lottery so you can share the joy. What else is there in life? Good for you Randall! You’re a free man, spend wisely! Congratulations on your win. One day without a doubt I will have a chance at winning a lottery – been playing since 2008, haven’t hit yet but if you got some good numbers to share that would be awesome. So that I can complete my surgeries I had 2 hip replacement, my right one first decompressed something like that but it shattered so they have to go back in soon. Just had a full left hip replacement, it’s holding up well, this will be 3 hip surgeries 2 on the right side. This 2nd hip surgery on my right side will be a full right hip replacement hopefully I’ll be walking this year was confine to a wheelchair/walker since 2010 after my coma. Everybody blessing come different way my health hopefully to follow wealth. Just have to have patience it will come soon enough. So enjoy your wings and congratulations again. May God continue to Bless You with so much more. Congratulations on winning the lottery. I too believe that one day I’m going to win he lottery and help all those people who have helped me in the past when I have needed it the most. As the saying goes, what you give you will get back. Kind regards and best wishes, you deserve it. Sure – I will be glad to take the free million offered me this morning. FYI – scam e-mail just received from someone posing as Randall Rush- they just want all your personal info to make it happen. Sadly this happens a lot Joe – thankfully you were shrewd enough to spot it. Big lottery winners set up funds and foundations to give money to good causes and charities. They never randomly send out emails giving their money away. So if anyone gets an email like this mark it as the spam it is, and know it had nothing at all to do with the winner whose name has been used without their knowledge or consent. So it’s a scam? I just received it and sent my information. Yes, it is 100% absolutely a scam. If you have provided any sensitive information e.g. bank details, you need to warn your bank what has happened. If you’ve only given contact details then just ignore any follow-up contact from them. If they persist just tell them you know it’s a scam and have reported it to the police. Congratulations. Unlike you, I occasionally buy tickets, and never think I’m going to win. But it is one of those little things in you that offers a glimmer of hope when you buy a ticket that you’ll be able to solve the world’s problems. No doubt the world will continue to spin, but I hope that he finds happiness in giving, does so diligently and judiciously, and that he never again has to pour from an empty cup. I really hope that he’s got a good financial advisor to earn him enough to keep the hungry fed. This makes me so sad 🙁 I have also received an email from Randall Rush and he wanted to offer me money before the end of the year :-/ I was glad to read this, because it was for me a dream to win 5 million dollar so I can start helping homeless people, investing and helping my self and my family but I have send also all my information and bank account number. I am now in shock 🙁 if this is a scam. I am really in need and homeless 🙁 Why why why??? Why do people do this? Why send a email to make people happy with nothing? I am now a internet victim. This is not funny!! You still seem a little unsure – that email was NOT from Randall. It IS a scam. Unfortunately there are a small number of people in this world that are happy to lie, cheat and steal. Thankfully however there are a lot more good people in the world. Just want to say congratulations to Mr Rush! Wow what a wonderful life event!